Most of the buildings in Berlin don’t bear the distinction of being designed by famous architects or under orders of King Frederick William II. Walking through the city you’re far more likely to pass by an imbiss shop or a residence (though that inconspicuous apartment building may have once housed Marlene Dietrich, like the one where I stayed during my visit). However, these anonymous shops and homes bear another distinction – many of them are part of the world’s largest canvas: the city of Berlin. As soon as I stepped off the S-Bahn in the Friedrichshain district on my first night in Berlin, I was enveloped by bombed-out industrial walls. I had decided before I left England that I would be making a trip to the East Side Gallery, but I had no idea how pervasive street art would be in Berlin or that it would occupy a central role in the identity of many of its inhabitants. 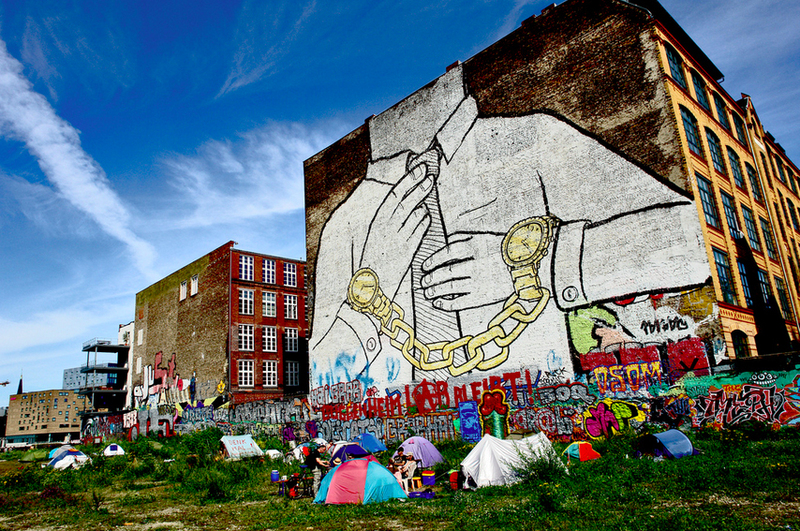 The Berlin Wall is perhaps the epicenter of the city’s graffiti scene. Young people, particularly those seeking to escape conscription, started moving to the Kreuzberg district, which was separated from East Berlin by the Spree. 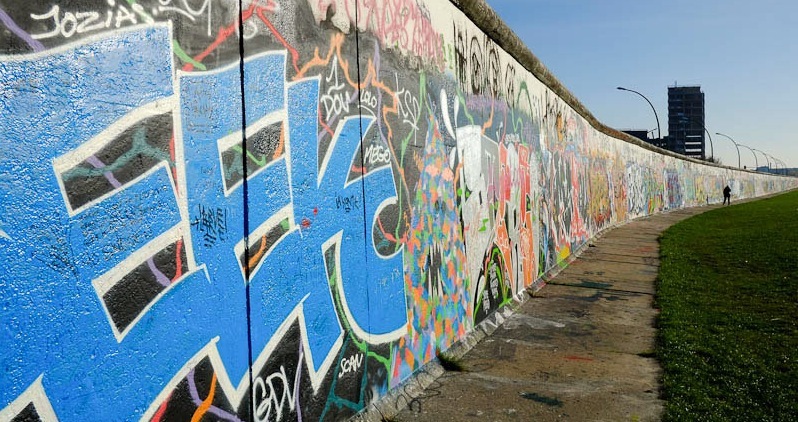 However, the wall lay several meters further back from the river, creating a sort of de facto autonomous zone, where the West Berlin police had no jurisdiction and East Berlin did not exercise its authority. 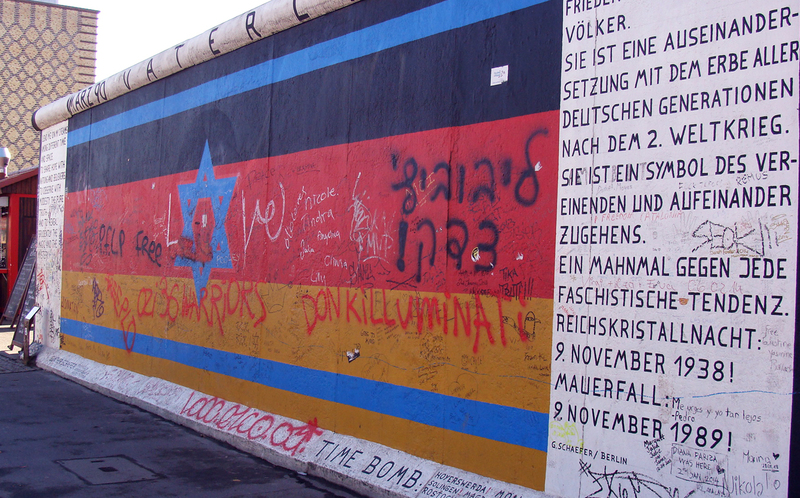 The space became a gathering point for parties and demonstrations, and is now where the portion of the Wall preserved as the East Side Gallery resides. 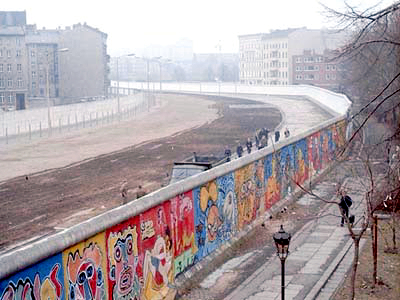 It’s hard to find two consistent histories, but it seems to roughly go that when the Wall finally fell, East and West Berlin art collectives joined forces to decorate the East side of the wall with over a kilometer of murals. Murals critiquing the Kremlin, murals celebrating the reunification of Berlin, and several poems. Artists from around the world participated, some invited, some just curious passersby. My God, Help Me To Survive This Deadly Love by Dmitri Vrubel. 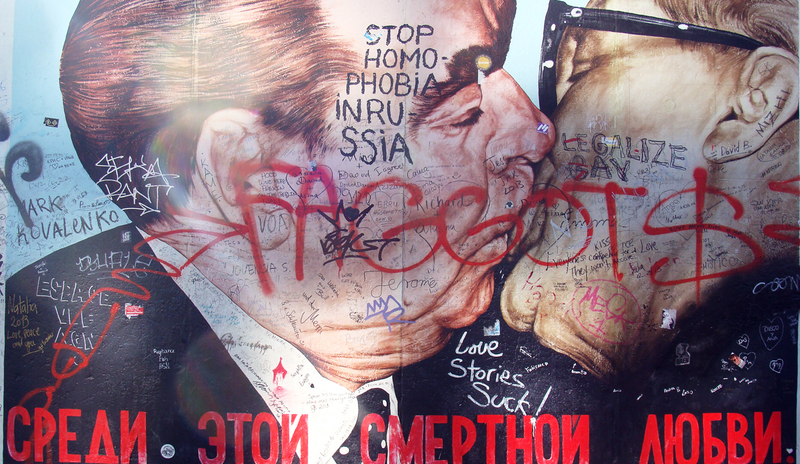 One of the most famous pieces portrays a “fraternal kiss” between two Soviet statesmen. The fraternal kiss was a ritual greeting among comrades to show solidarity with those who had to endure long journeys under harsh conditions. However, as is apparent from the tags that have been added to the piece, the image has taken on new significance in the current political context. There’s a tension between tags that have been painted over the original works. The East Side Gallery Society has encouraged artists who painted at the wall to report tags to the police as vandalism, which sends a message about whose art is regarded as legitimate and valuable. While in some cases I think tags have degraded the previous work, I am excited by the fact that it is an exercise in direct engagement with artwork – something that most galleries or museums in the world make impossible. I have tend to find volatile, confrontational, interactive art more stimulating than art that has become sacrosanct and is presented in a sterile environment. The tags on the fraternal kiss and other paintings reflect the state of our culture, for better or for worse, and I think enrich the painting’s relevance even if its aesthetics suffer. Most street artists have always operated under the assumption that their art was subject to decay, defacement, and destruction whether by competitors or authorities, and it’s become a defining characteristic of graffiti and street art culture. The fact is that many of the artists who participated in painting the East Side Gallery were not seasoned street artists, and in some cases had no artistic background at all. The art on the West side of the wall and elsewhere in Berlin shows this different character. Tags and bombs abound, and while larger pieces are also quite common, they are frequently less colorful and more confrontational. I was told of two huge well-known murals of this type by my host, Victor. The enormous figures overlook a camp in a vacant lot adjacent to Cuvrystraße. Victor said that I should go see both the mural and camp before they are removed by developers. He said that gentrification was becoming a big issue in Berlin, and that many of his favorite spots, including these murals and the bar where I met him on my first night in Berlin, will soon be swept away in the rush to attract wealthier residents. Cuvrystraße has already been at the center of disputes over land use when BMW and the Guggenheim Foundation wanted to erect a “lab” (it’s not clear to me exactly what it was supposed to be) on the site. Protests drove them away, but local residents remain divided over whether the land should be left vacant. Poem/manifesto at the entrance to the camp. The issue of gentrification is a familiar one to me as a transplant to New York, which makes me directly involved as a stimulant, beneficiary, and sometimes victim of the phenomenon. 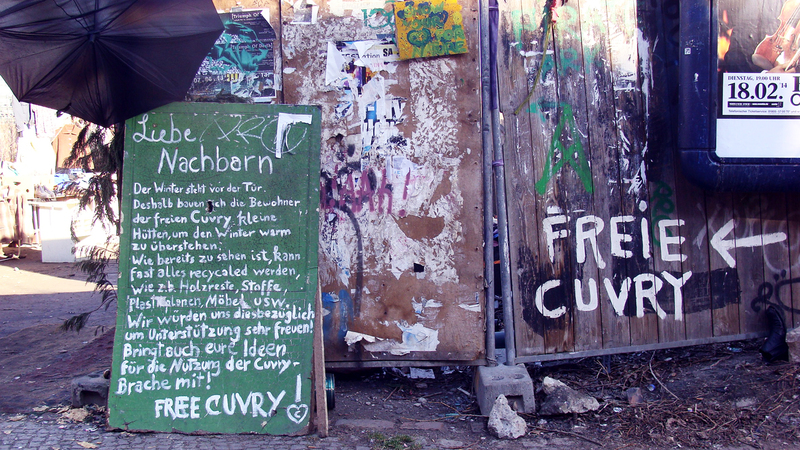 The Cuvrystraße camp would not be the first squat to be displaced by gentrification – some squats’ artistic output has attracted so many tourists that property owners who were previously disinterested in the buildings or lots hosting the squats have suddenly become interested in monetizing the increased traffic. Similarly, sections of the East Side Gallery have been removed for the benefit of the O2 World arena or new luxury housing (planned by developer Living Bauhaus, an ironic name given the Bauhaus’ focus on producing products and housing that would be available to the working class). These events certainly have parallels in New York with the recent destruction of the famous Five Pointz in Queens to make way for luxury apartments. 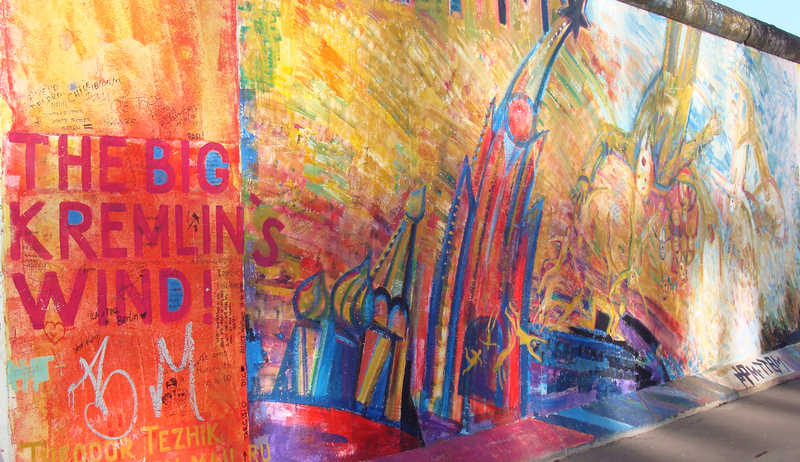 Simultaneously the East Side Gallery has been criticized by artists who originally decorated the Wall. Artists were notified that due to physical deterioration and tagging of the Wall that a restoration effort was being planned by the city. They were “invited” to repaint their works for payment of only €3000 (despite it being well-known that the city had allocated €2.2 million for the project, most of which went to contractors), and warned that if they did not accept this invitation that their works would be whitewashed and replicated by other artists. Some artists refused, and subsequently sued the city for copyright infringement. One artist staged a protest by whitewashing his section of the wall and panting a new mural, years after the restoration had concluded. These artists feel that the city is only concerned with generating more tourism revenue from the gallery, without offering any financial or legal support for its preservation or progress. While some street artists have had commercialization forced on them via gentrification or even by theft and resale of their work, some artists have managed to navigate into the moneyed mainstream under their own direction. The work of several street artists has become so recognizable throughout the city that they have successfully moved into exhibitions and sales in galleries. Entrepreneurs have definitely taken notice of the trend. Walking past bars and cafes, it was sometimes hard to tell if they were adorned by the work of a street artist or by an advertisement. 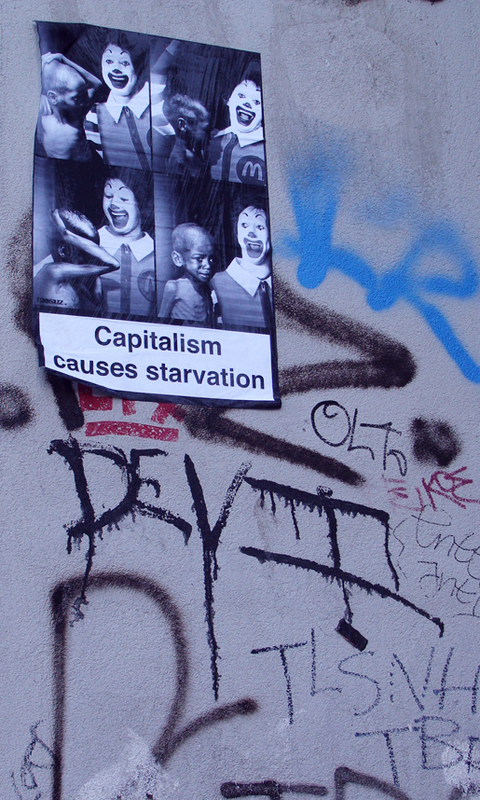 For those in the US, and particularly who were in New York City last October, the phenomenon is probably reminiscent of the hype surrounding Banksy, who has also suffered theft of his work, been widely imitated, but mostly these days simply produces high-priced commodities. 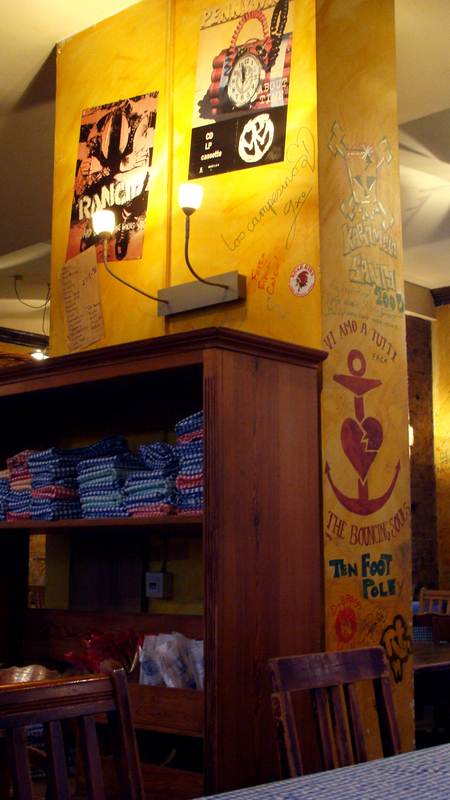 I concluded my day of exploring the street art and graffiti of Berlin by visiting a pizzeria. When I walked in, I was pleasantly surprised to see names and images scrawled all over the walls. As I continued to a table, a theme started to emerge: all the names were band names. Sometimes accompanied by a message, doodle, or even a poster, I started to suspect that this wasn’t just the work of customers and employees who shared a passion for punk music. As my waiter walked by, I asked him, “Did all these bands eat here?” There was a message and poster from Gorilla Biscuits, who I had thought had disbanded in the early 90s. When his answer was yes, I was shocked. I later found out they did a reunion tour in Europe several years ago, but it was still amazing to think that I was having pizza in Germany in the same spot as so many punk bands. If New Jersey natives, The Bouncing Souls, approve of the place, then I could only trust that I was in capable hands. And the pizza was good! It would hold its own if it was in New York City. 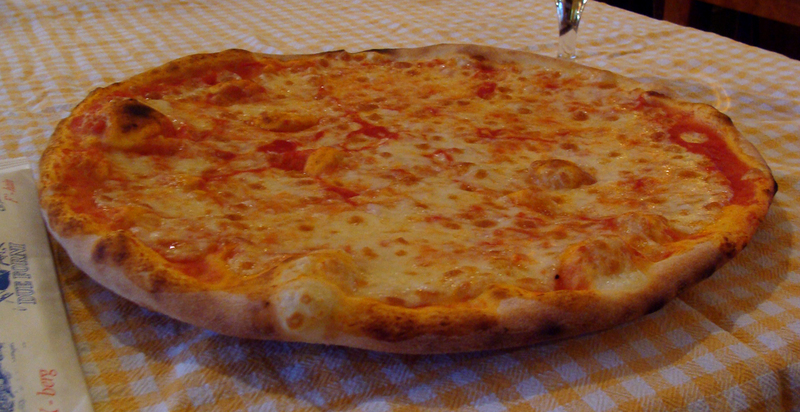 There are quite a few pies I prefer, but this is probably the best pizza I’ll have (that I didn’t make myself) until I get back to the States. Contrasting with the horrible pizza I had in Cardiff, the pie was not overtopped, the sauce was flavorful but not too sweet, and the crust was neither flimsy nor tough. There were some bubbles where the crust had picked up some extra color, making for a particularly delicious bite. It served as a very satisfying conclusion to my trip. This entry was posted in pizza, travel and tagged art, Berlin, Berlin Wall, commercial, design, gentrification, Germany, graffiti, history, narrative, street art, tourism on February 17, 2014 by Dylan Bargteil.